The Progress-Focused Approach: What were they thinking? If you look at the work of any organizational theorist who has ever lived, no one except for perhaps Nobel Prize Winner Herbert Simon exceeds the breadth and depth of Jeff’s contributions. 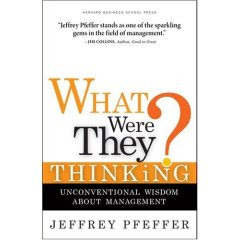 Jeff isn’t as well known in managerial circles as Peter Drucker or Jim Collins. But I believe that his work should be as well-known because his ideas are so research-based and so practical. And unlike most star academics in his field, Jeff is deeply immersed in the stuff of organizational life. And no matter how strongly you disagree with him, he has this annoying habit of basing his arguments on the best theory and evidence in peer-reviewed academic publications. Plus when he writes about an unstudied topic, his logic is often so compelling that refuting his arguments is extremely difficult.